A relationship where one dog is the troublemaker and another becomes the protector is more common than you would think. We’ve seen some hilarious pairs of dogs over the years. 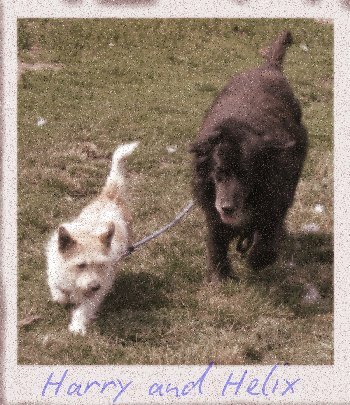 Harry (a large black Lab X) and Helix (a small scruffy Terrier) were inseparable. Entirely devoted to each other, Helix was a typical noisy terrier. He’d bark his head off, cause trouble and run off with a look on his face that was pure joy. He just loved causing mischief. Harry on the other hand had a wise old head on his shoulders. He never got involved in Helix’ nonsense unless Helix had got himself in trouble. Then, Harry would step in, and with one swift move would remove Helix from the situation and calm everything down. On occasion he would also tell Helix off. Harry always acted like Helix’ dad, he’d protect his little friend, but wouldn’t let him get away with too much. Relationships in groups of dogs often get more complicated than that. There’s nothing more fascinating that watching a group of dogs interact with each other over a long period of time. What you learn is that each individual dog has their own skills and interests. What becomes most fascinating is watching and learning that the traditional idea of the ‘pack leader’ becomes entirely redundant.